First day of December = The Advent Calendar. Tyler had her Manu Poi assessment at school on Friday. The whole thing was amazing. I was very moved by it all. She got an A+ by the way. I made my Mum come with me to it. She said Friday was a good day for her. Two things made her proud that day. 2. The red lights on her Christmas tree. Avi stayed the night last night. I'm pretty sure she hates Hubba because Hubba loves her too much and always wants to cuddle her. Hubba wasn't allowed give me a cuddle goodnight last night. Hubba wasn't allowed to sleep in my bed with us and Friday nights Hubba knows she's allowed to sleep with Mum. Hubba wasn't allowed to help her when she fell over. Hubba is glad she is not staying tonight. 12 hours of sleep and looks this cute at wake up. She's a fat ball of delicious .. and a little bit of agro. Mitchy commented yesterday that she doesn't understand why Hubba and Avi are so white compared to her other kids. I told her it was because they were both supposed to be mine. I miss California this time of the year. 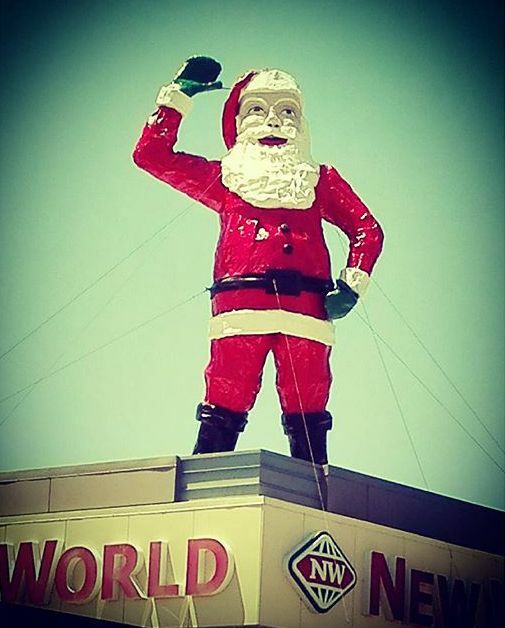 New Zealand is so bland with it's Christmas celebrations and the best thing we have in town is the huge Santa statue on top of the New World Supermarket. He's been around since as early as I can remember. I think he's the same Santa that Fantasyland use to rock when it was open. This month is going to be a good one. Those are some cute pics of the sisters. When Daniel was little I used to love him a little too much too. I would always pull him around on a blanket I had tied around my waist so he could come with me where ever I went :) He hated it and constantly cried.